This is an exclusive. A real customer of ICICI in India talks us through her experience of accessing her accounts via the bank’s dedicated facebook application. Security is a key trait of the service. Earlier this month, I announce the imminent launch of a new series on the Visible Banking blog, the ‘Voice of the Customer’ or ‘Customer Voices’. Basically, on regular basis we will ask regular bank and insurance customers to share their thoughts on the topics of social media and digital engagement and on specific initiatives on the likes of facebook or twitter. I am delighted to publish the second article of the series and the very first article in English (99% of our articles are in English, but the first customer-generated article was in French). This article is on the banking application launched by India’s ICICI on facebook a couple of months ago. The bank has just reached the 300,000 likes barrier and I believe this specific application is currently used by 20,000 users every month. If you want to check how ICICI compares in the worldwide financial services industry on facebook, we invite you to check the latest updates from our Visible Banking Facebook Watch series (tracking over 1,300 pages and apps in 78 countries). So many consultants and online resources have hurried to cover this application days after launch, but did you have a chance to try it and experience its interface? Probably not. So, I bet you will find this article rather insightful. ICICI Bank is undoubtedly one of the leading Banks in India today, and now, with the launch of its Facebook Application, it has clearly steered ahead of others. This user friendly application is aimed towards assisting customers with smoother banking transactions and directly from Facebook. 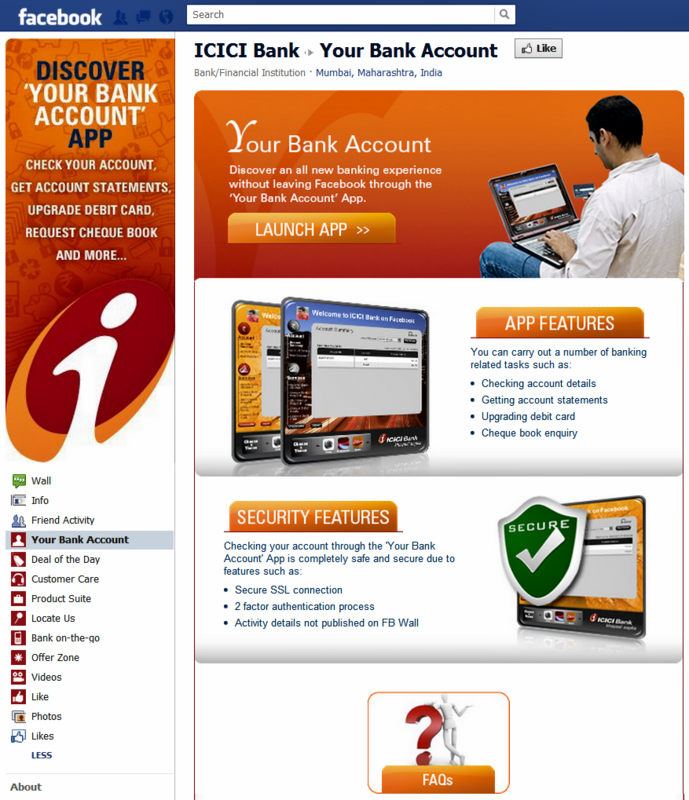 This application is hosted on the very secure ICICI servers and is available to the users through SSL connection. It makes it easy for customers to check their accounts, get mini statements, make application for debit cards and also request checkbooks. On clicking ‘Launch APP’ I was guided to another page where I was required to fill in details like Debit Card No and also PIN number. …quite simple and hassle less. Checking out the features of the application, everything seemed quite straight forward and user-friendly. * Checking account details in just a click– my complete account detail was in front of me… checking balance will take a few seconds. * Mini Statement for the last 10 transactions – I don’t have to wait to visit ATM or my bank to know about the last few transactions I did. * I will also get my e-statement right into my Inbox. * Upgrading my debit card is also just a matter of a few clicks. * Check book request, stopping the payment for check and checking the status of any check can also be done through this application.